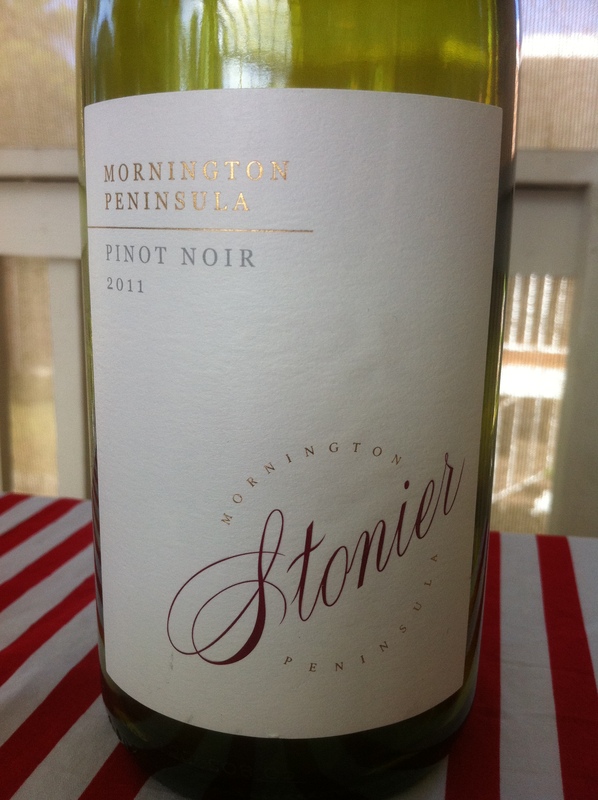 We had some friends pop over for dinner recently and they brought with them a couple of bottles of 2011 Stonier Mornington Peninsular Pinot Noir. It was funny how the hand-over of said bottles went… “We weren’t sure what wine to bring over. You used to be just the guy into wine, now you’re a wine wanker, so in the end we just decided to bring wine we like” lol. There’s some confirmation in that, but aside, I’ll drink any wine a guest brings over and if it’s a wine they like then that’s an added bonus. Actually, I’d be a bit worried if they brought a wine they didn’t like, but hey, I’d drink that too! Our friends are fans of light red wine and this was the perfect light red evening, a balmy 27 degrees or so (in proper Celsius that is, and sorry to our friends from Canada and the US who are currently suffering living in an iceberg, and to those living in the recent cold wet swamp conditions of the UK and Ireland, you poor people… 😛 ). So we decided to set up out on the deck and enjoy an array of cheeses from goats to sheep. Mmmmmm. 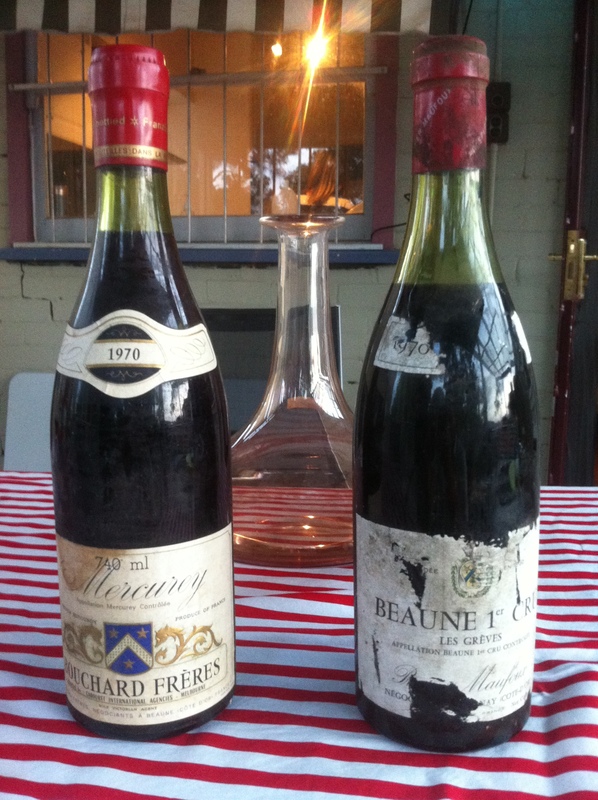 Seeing as we had some Pinot fans on our hands I decided to pull out a couple of 1970 Burgundies that I’d picked up from auction for about $35 or so each. I’d been waiting to compare a modern light Aussie Pinot against an age-old Frenchy. To be honest, I didn’t hold too much hope for the 43 year old wines but it was a gamble I was always willing to take because success would make these are bargain. First up was the Stonier Mornington Peninsular Pinot Noir, a wine that sells for around $27 and was awarded a very honourable 94 points by James Halliday. The Mornington Peninsular, east of Melbourne, is known for producing some of the best examples of Aussie Pinot. This was an extremely light red in the glass and the comment was made that it even looked like a Rosé. It gave off wonderful floral aromas and the berries were well there and inviting you to tuck right in. On the sip the lightness was confirmed with it being very easy to drink and quite inoffensive. Even though it was very light it handed over enough flavours to make it enjoyable, with hints of cherry and currants along with a very obvious backdrop of spice on top of oak. Although not anything overly special at all it fitted in perfectly with the ambience of the balmy evening outdoors. I’d happily drink it again. So sitting back enjoying the cheeses, but being out of Stonier, I poured us all a glass of the 1970 Prosper Maufoux Beaune 1er Cru ‘Les Greves’ Red Burgundy. Looking at the condition of the label, the capsule, and the level of wine in the bottle, surely this wine would be no good? On the nose there was no hint of oxidation at all, none! Yes it was a little musty, and probably could have done with a little longer in the decanter so as to throw that off a bit, but there was so much fruit aroma still apparent. Sipping it was a joy. There was lots of fruit left in the wine but it had become quite complex and nutty… almost Christmas cake like. And in there was the spice along with an enjoyable smoky backdrop. Strangely, it was a rather heavy wine but the flavour just lasted and lasted. It was an amazing match with the cheeses, especially the spicy sheep’s cheese. Yummo! Even if the other Burgundy was to let us down we’d already been rewarded! Maybe luck was to be on our side? Sadly we fully drained the first bottle of Burgundy so I poured us all a glass of the 1970 Bouchard Freres Mercurey. This bottle was in much better condition with a perfect capsule, one of the thickest and strongest I’ve seen, along with a cork in top condition and a high level of wine still in the bottle. In the glass it smelled so similar to the ‘Les Greves’ and was the exact same very dark red. Again, no vinegar smells, a good sign! Amazingly it also tasted very similar to the first bottle only a little spicier but not quite as long-lasting. We savoured this one and sipped it slowly enjoying just how well it too went with the cheeses. Both of the Burgundy Pinots were so far removed from the Stonier but there was a common connection that several of us could sense, and that was the background of spice and tang that was very similar in nature across all three wines, and very enjoyable in both styles of wine. It was the distant family connection, the hint of the Pinot clan! Previous Oops… I did it again. Next Breaking the rules on pairing wine with food! I want on a dinner date with the mom tonight. We went to a wine and cheese bar. I don’t even know we got, but it was 16$ a glass. It better have been good wine! lol. As long as it’s fun you can probably forgive the $16/glass, but it is a bit exy! We were at a (one of the many 😉 ) wine tastings here in Nov (tis the season) and were so surprised to walk away with a Swiss wine, even though we live here lol! I was intrigued by the opening gambit, ‘just a guy into wine’ becoming a ‘wine wanker’. Since I have been reading, nay savouring, each pearl of wisdom you guys espouse (wonderful blog) I aspire to become a wine wanker. Not a wine snob, they’re like the sociopaths of the wine world, whereas you guys have empathy. In my part of the planet you might be called a “wine geek” or more derisively, a “cork dork.” Anyway, love the blog. Hoping you can expand my horizons on New World wines. Best regards from California. Awesome post Conrad, but please stop reminding us about the weather!!! 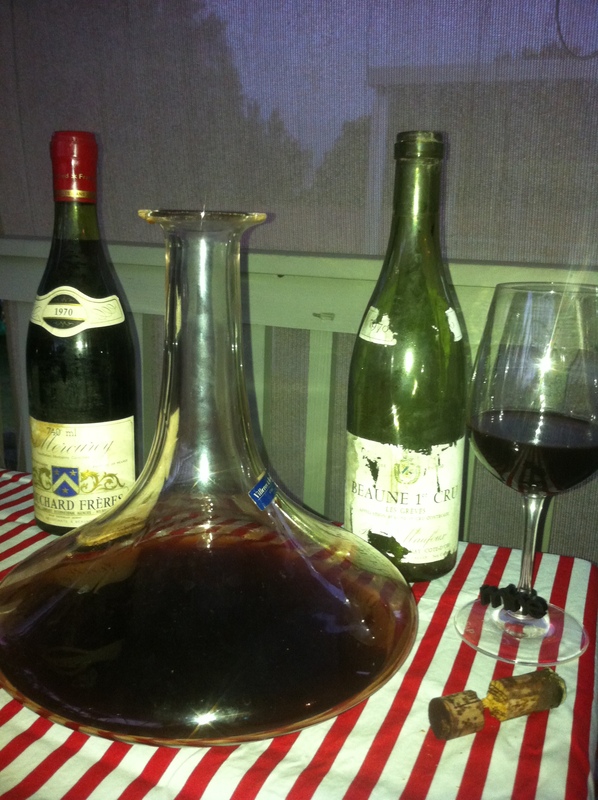 Vicariously enjoying those ancient bottles, and the cool decanter…not to mention your balmy temperatures! Thanks Linnet! It’s one of the first gifts my wife got me so I better not break it! It gets a lot of use. The bottles make me homesick! And the mention of the cheese tray too! I love red wine, especially light, which can be an issue to find here in California where reds are heavier due to more sugar. You’ve been lucky with such old wines. My dad used to keep red wine in his cellar and once in a while we tasted a true gem while sometimes it was awful. I’m far from being a pro at wine but I truly enjoy reading about your journey through wine and life. Cheers to you and everyone reading your lively blog. As you probably realize, I’m not much of a wine connoisseur. Having said that, I’m all for the older fighter having one last good bout, so I was pulling for the 1970 Prosper Maufoux Beaune 1er Cru ’Les Greves’ Red Burgundy. According to my wife, I’m complex, nutty, fruity and a tad heavy, so that wine seems to be the perfect fit for me. Given the non-trivial age of these bottled ladies and their ability to attract your eye, perhaps you should refer to them as wine cougars. “Our friends are fans of light red wine and this was the perfect light red evening, a balmy 27 degrees or so… So we decided to set up out on the deck and enjoy an array of cheeses from goats to sheep. Mmmmmm.”…rub it in why don’t you. Enjoyed the post from Canada anyway! That’s the term I’ve been looking for the past two months: a cold, wet swamp. Truly a delightful winter for Finland (not). Back on topic though: What could be a good starter red wine for a person, who does not like it that much? I would really like to learn to appreciate the red color of the wine spectrum. I typically go for the light, fruity, citric white wines… But my color blindness is starting to get annoying for myself as well. It’s amaizing the wine were still fine. Those old bottles are difficult to store properly! Yes, I got lucky! Thanks for dropping in. Cheers! You’ve got a knack for describing wines! And like many others I’m jealous of your weather. I got into wine when I lived in Aus and I still side with new world more than old! I come for the words, not the wine. Love the way you guys write and express yourself!! Getting famous as a Wanker eh… LoL. I opened my fridge after Christmas day to discover a bottle of Passion Pop sitting next to my very nice sparkling shiraz. I am a little scared to open it..
Also, is there any truth to the theory that you don’t get a hangover from organic wine? Your wine blog is taking off! Great to see that. Yes, they were. Thanks for dropping in on us. Salud! When I graduated from college in 1977, I thought I would become a wine connoisseur. It didn’t work out. I couldn’t find any wines that I liked! Now that I am much older, I do have a greater appreciation for wine, but I’m pretty much a white zinfandel guy, although not afraid to try anything out there. Love wine and am thinking of taking a one-day course to better acquaint myself with its subtle complexities; however, I still defer to your wineliness! As I envision all this taking place, it seems to me you have a pretty good life. I bet there are about a billion of the 7 billion on this planet who would trade places with you. I think it is important to be reminded from time to time just how lucky we are. It helps to keep grounded and to appreciate life more. Thank you!